There’s less than a weeks to go until the annual Fremantle Ports Maritime Day for 2017! 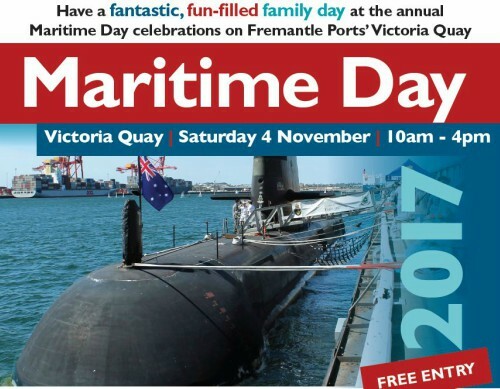 Held at Victoria Quay, Fremantle, this fun filled day should be placed on all families calendars – and circled, twice. There will be action not only throughout Victoria Quay, but also inside the historic B shed and even in the water! The Royal Australian Navy will have extensive shore displays and a submarine HMAS Waller quayside. Other vessels along side will include the refuelling ship Vacamonte, Svitzer and TAMS Group tugs, a river dredging barge, STS Leeuwin and Fremantle Ports’ emergency response boat. Maritime dress up: Children are encouraged to enjoy the day by dressing in a maritime theme – anything nautical, for example a pirate, a mermaid or a sailor. There will be a children’s fancy dress parade. Entry by gold coin donation to the Western Australian Maritime Museum for the day including Roman-themed activities involving craft and digital animation. Australian Border Force will have a detained goods display along with detector dogs. This event has a huge emphasis on information all about Fremantle Ports, the maritime industry and maritime careers. For more information on Fremantle Ports Maritime Day, head to their website.